First off, there are a few things needed if you want to do it just like I did. If some factors are different for you don't give up the idea of having a cribbed big kid bed, just get a little more creative. As you see it, this is with the side dropped down. My almost two year old was getting hard to get in the crib and hard to get out. That small space only allowed us to drop him in when putting him to bed. 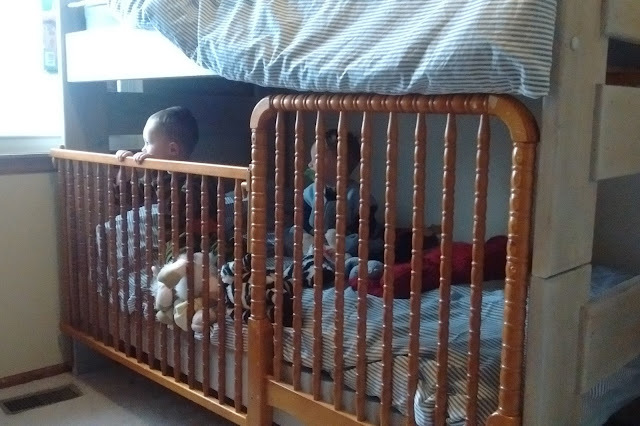 Although building a bunk bed around a crib is a great idea (especially for small cribs like Ikea ones), this solution wasn't a long term one. Both of my youngest don't share a bed, but both thought this new prison bed was so awesome and wanted to play in there. Before I tell you how to do this yourself, I want to mention that I didn't paint the ugly brown crib pieces before installing because I didn't know my contraption would work. Now that I took the guess work out of how to make this, please prep your crib pieces after dismantling from the crib, and before you install for the big kid bed. 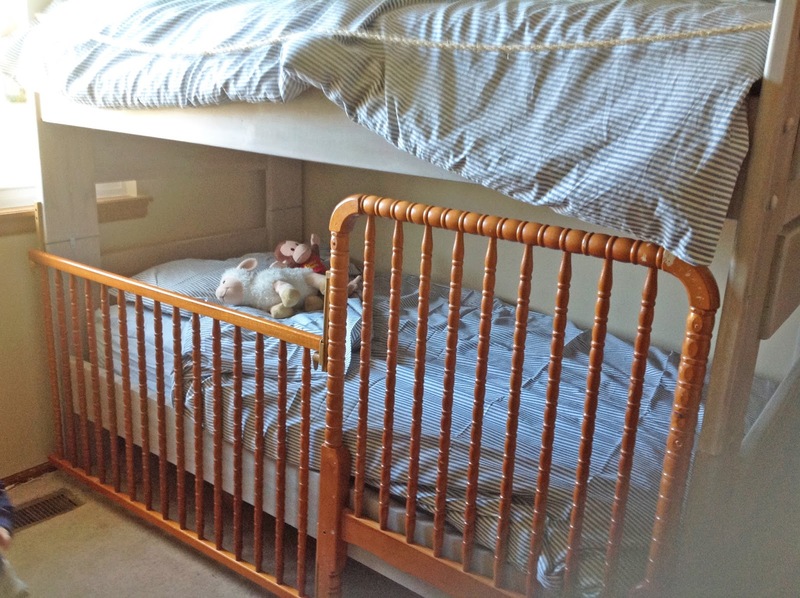 Dismantle crib. Remove all screws, etc. so that it breaks down into the four sides. 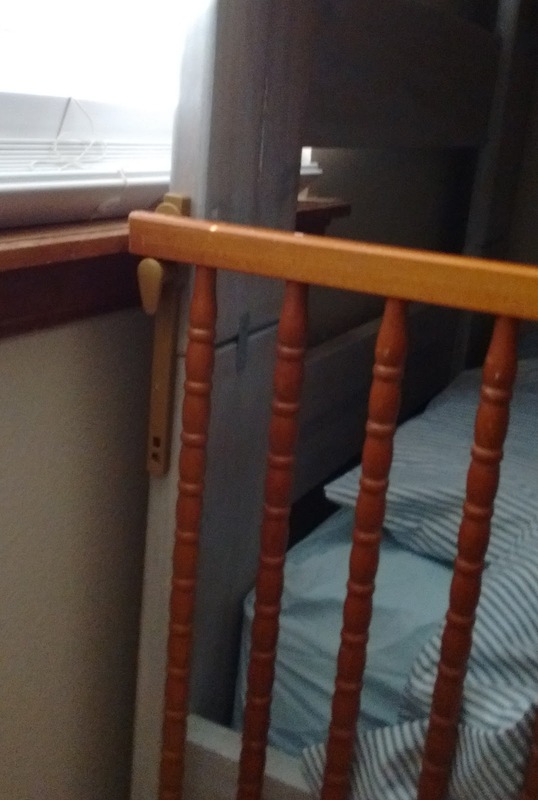 Use one of the ends of the crib for the end of the front of the bed. (It's the taller piece at the foot of the bed). 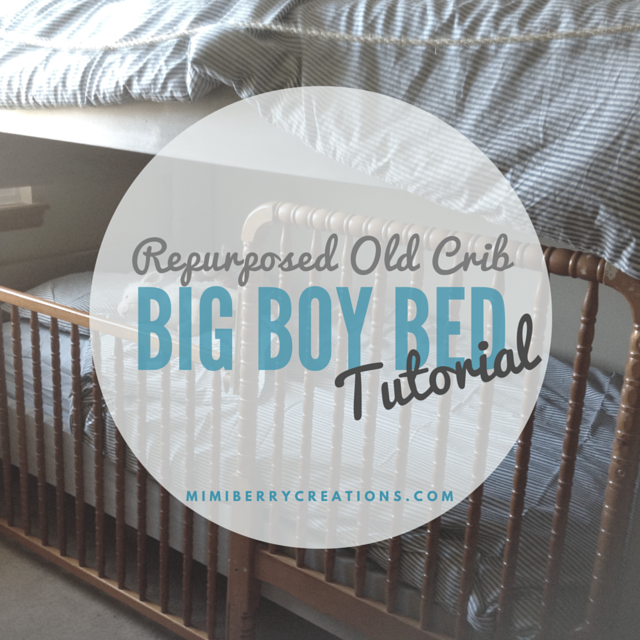 Before screwing it on to the frame of the bed, take one of the sides of the crib and measure to see if you need to cut off any of it to fit lengthwise on the big bed. (I had to cut off around 5 inches. I used my Dremel Sawmax for this since it is so portable, but a number of tools will accomplish this). So sweet huh? Love that he stayed asleep while I took this picture with my phone. ...and below. And then you need to screw on the sliders that fit on the guide, onto the crib piece. Key thing to note is that there is a certain order to this. Screw in the guides first. Then screw in the sliders. They will then need to slide from the top of the guide down to click into place, so make sure that you're going to be able to do this (i.e. 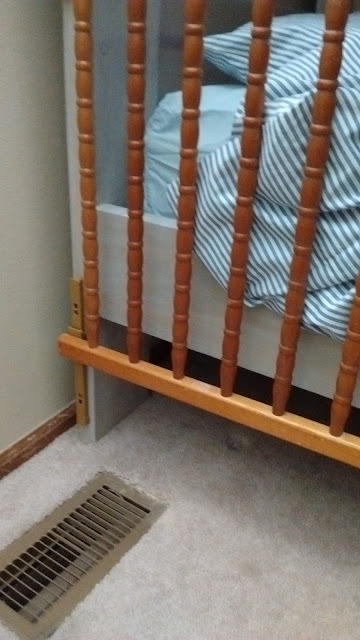 if the larger crib piece that goes at the foot of the bed is already screwed into the bed, this step is tricky. I literally had to unscrew and re-screw in the guides a million times for me to get the exact steps needed. Wish I could provide you more accurate steps, but you will see as you go and it will start to make sense what I mean). If you haven't screwed in the part by the foot of the bed, make sure you do so now. I used two large screws and put them into two holes that were already in there from when it was a crib. With just one screw on each end it is very stable and strong, but test yours out to see if more than two screws is needed for strength. Test to see if you can lower and raise your new "bed gate". If it doesn't work you might need to alter where your glide guides are set up. If any of the guides are angled that is a problem so make sure they're straight up and down. If you notice in some of the above pictures, my two year old could very easily get out at the foot of the bed. He hasn't figured this out yet so I am not worried, but if he does I will use the other crib piece (from the end of the crib) and fit it in between the mattress and the bunk bed frame. It will fit perfectly, I just didn't want to have to take down the "bed gate" to put that in. If you have an escape artist, do this step first. And there you have it. 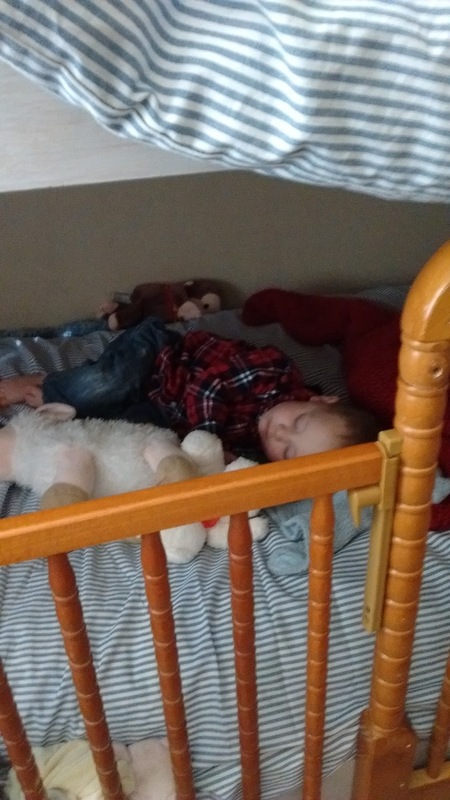 A way for your little one: 1. to get used to their new big kid bed, 2. be kept from rolling out when sleeping, and 3. not be free to run around his/her room during nap time or bed time. 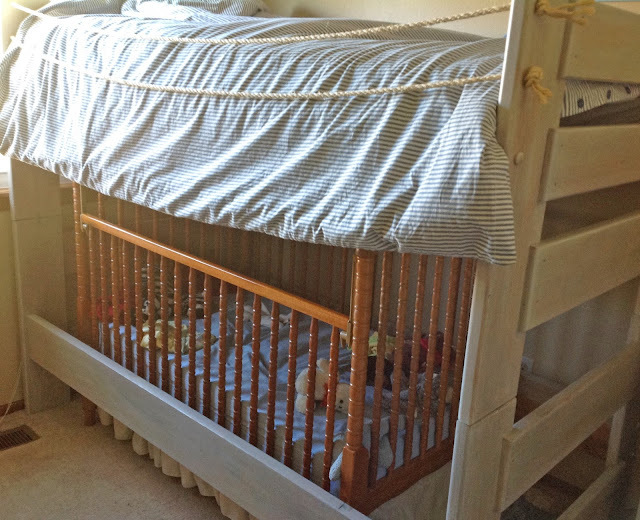 If you don't have a drop down crib, there is probably another solution that can be made. Feel free to submit a picture in the comments section and I would be happy to offer any possible ideas. My motto in life is "where there is a will there is a way" and I definitely had a will to have my little guy grow up, but not too fast. Glad I found a way. Hope it helped some of you! 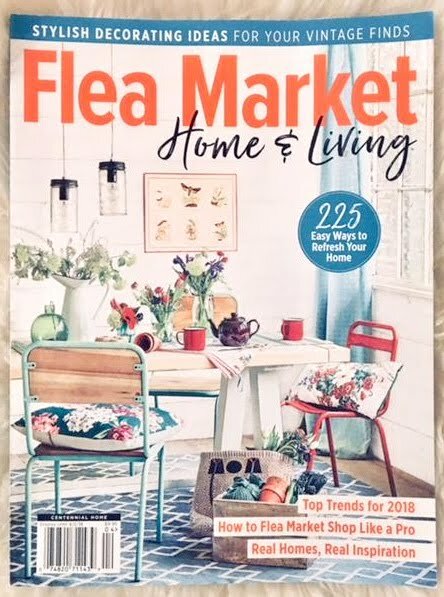 I would love to hear your thoughts, ideas, or questions so please comment below! You are a creative genius, sister! I love it!